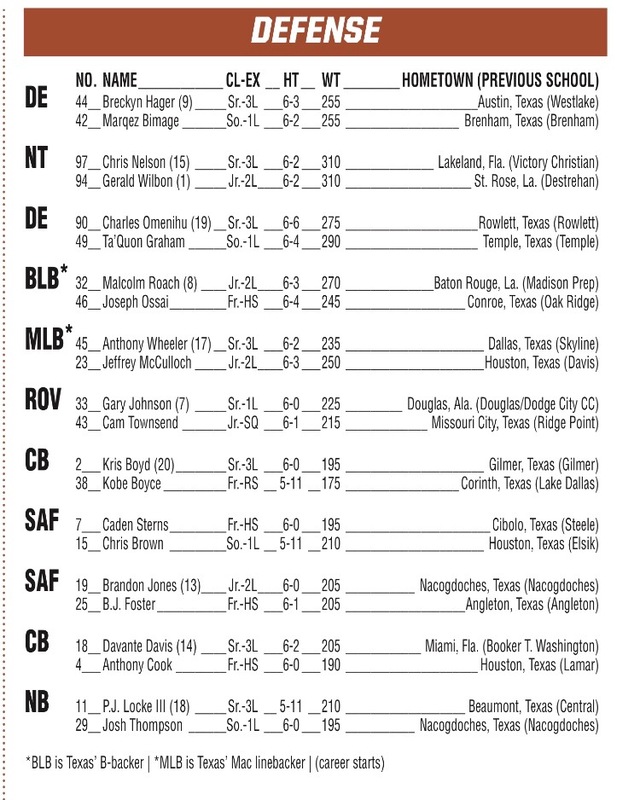 Texas released the depth chart earlier this week. Defensively, no real surprises. Of note, you may recall that when Ossai first arrived, he was the first freshman name we mentioned. It’s obviously way too early to be dishing out compliments to the newly arrived freshmen. They have started working out but again it’s early. 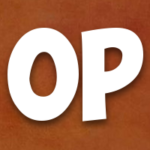 However, I did want to note that I heard from a source that the initial impressions of Ossai in terms of attitude and how he looked coming into the program is really good. It looks like he was using these past few months of high school, wisely. ***Tre Watson coming in and taking the running back spot. How about that? Whoever inside the program pushed for him…well done. ***Early in camp, Ingram was run behind the pack. We had been told he’d surge up the depth chart. Appears he has done that sitting just behind Watson and Young. ***Cosmi is another guy who had a great camp and is now mentioned alongside Derek Kersetter as the starting right tackle. 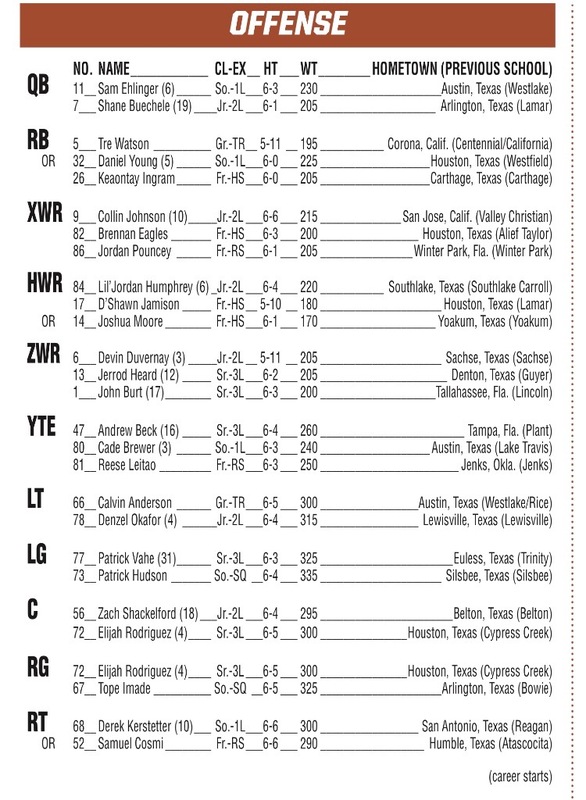 ***As we noted all along, Calvin Anderson would be the starting left tackle. Texas is in the market for two or three more linebackers. One of those targets is JUCO LB and Tennessee commit, Lakia Henry. Despite his commitment to Tennessee, Henry let me know recently that he will take an official visit to Texas. He says he’s looking to take that visit sometime in November. Henry had hoped to take an unofficial visit to Texas at some point but to my knowledge that did not materialize. So, this official visit will be his first Texas visit. Please keep in mind that “trending” in these posts means there is some information available to us that makes us believe that to varying degrees Texas is moving the needle in (or back in) their direction. 2020 ATH Mookie Cooper: Cooper is expected to visit for the USC game. He loves Texas. He tells me he is eying a January commitment. This will be his second visit to Texas and he will be in town along with his friend and teammate, Marcus Washington. This guy is absolutely electric. Texas hasn’t had a guy like this in the Burnt Orange, in a while. 2019 WR Marcus Washington: Washington was scheduled to announce a decision in early August but as we predicted the decision was pushed back. Since then he had set up an official visit to Texas for the USC game. Washington was supposed to make his choice between Ohio State and Missouri. Many believe that Washington was going to choose Ohio State and the issues surrounding Urban Meyer caused the delay. However, my sources in the St. Louis area indicated that he was actually going to choose Missouri and the delay was in no way connected to the Buckeye debacle. Texas has a very strong relationship with Marcus and his family. It’s a much bigger program and stage than Missouri. I suspect the visit to Texas will be eye-opening. Team to Watch: Missouri. Marcus’ head coach is a former Missouri wide receiver. However, he doesn’t strike as the kind of coach who pushes his players in any particular direction. As you know by now, Texas has been in hot pursuit of 2019 GA RB, Derrian Brown (Buford). I type this while I’m sitting in the airport waiting on my flight to Georgia as I plan on seeing some kids in the area this week, including Brown, as I mentioned. I spoke with Brown’s coach earlier today and asked him about Brown’s decision timeline. Coach said a decision is coming soon. I asked if there is an exact date and he said, “Not yet. He’s trying to get up to Texas as soon as possible”. ***Breckyn Hager described what the phrase means to him. 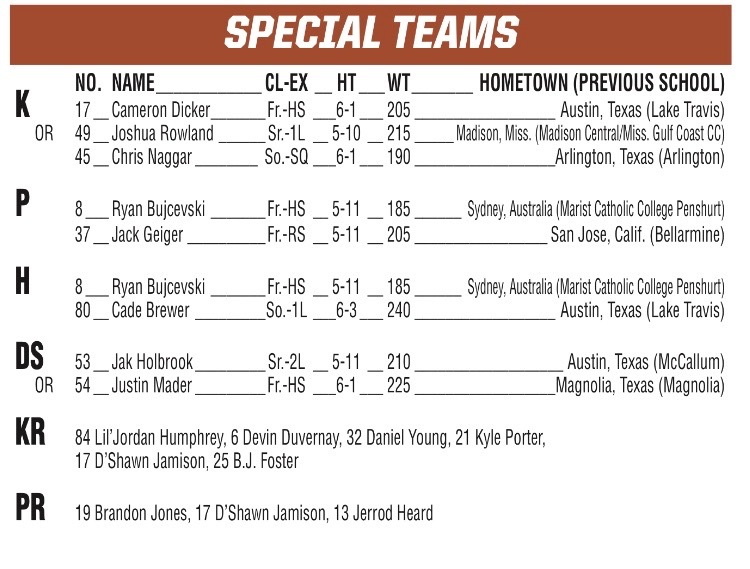 ***Sam Ehlinger said Cade Brewer, Andrew Beck and himself all watched film from Texas’ 51-41 loss to Maryland in last year’s season opener. ***Several players said they aren’t even thinking about last year’s stunning loss. Kris Boyd was hesitant to use the word “revenge” when asked about it. ***Hager didn’t want to entertain past thoughts from last year’s game, but he did tell us what he saw when he watched the film of the loss. ***As for Sam, he has had the opportunity to prepare for this season opener as the starting quarterback for nearly two weeks. According to several players, Sam has seen major developments from his freshman year to his sophomore year. ***It’s no secret, Sam suffered from a severe deprivation of experience last season. He even acknowledges it, but that’s why nearly beating USC in his first start and almost leading Texas to a comeback victory in his first Red River Shootout is even more impressive.